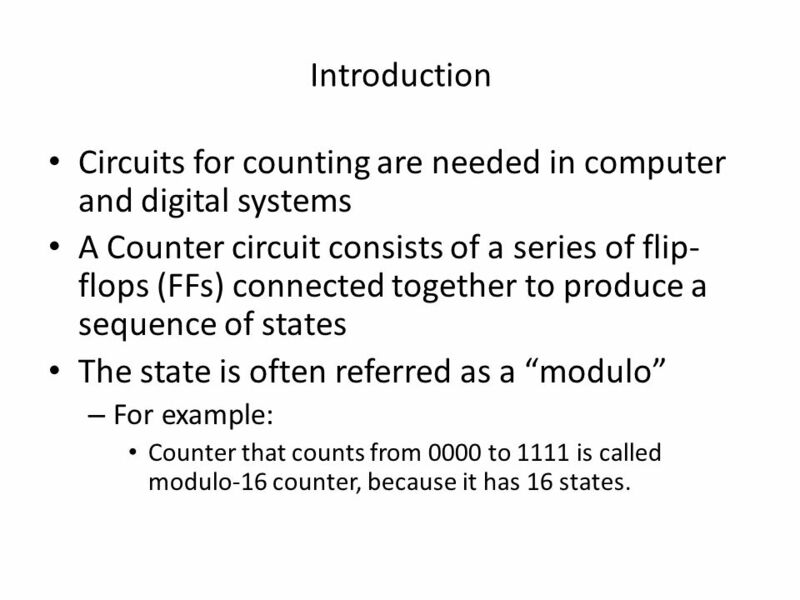 Introduction Circuits for counting are needed in computer and digital systems A Counter circuit consists of a series of flip-flops (FFs) connected together to produce a sequence of states The state is often referred as a “modulo” For example: Counter that counts from 0000 to 1111 is called modulo-16 counter, because it has 16 states. 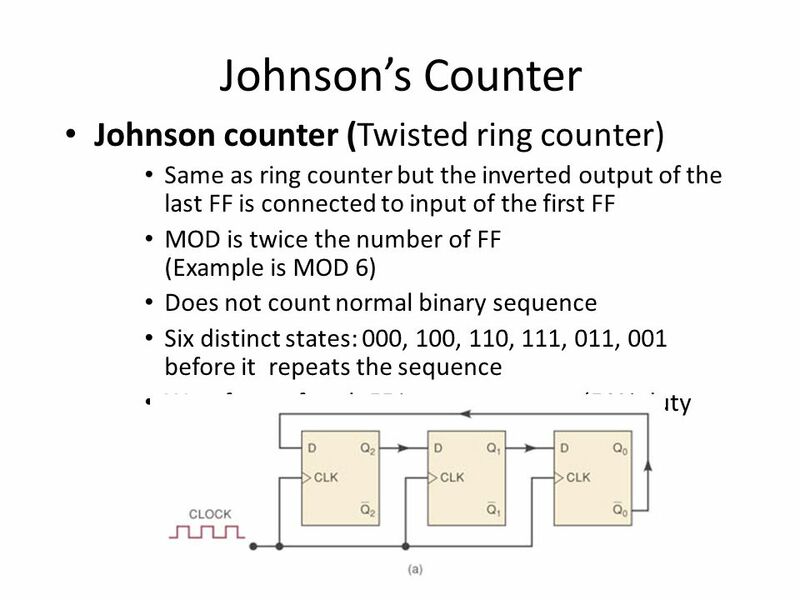 8 Frequency Division In any counter the signal at the output of the last flip-flop will have a frequency equal to the input clock frequency divided by the MOD number of the counter. E.g. 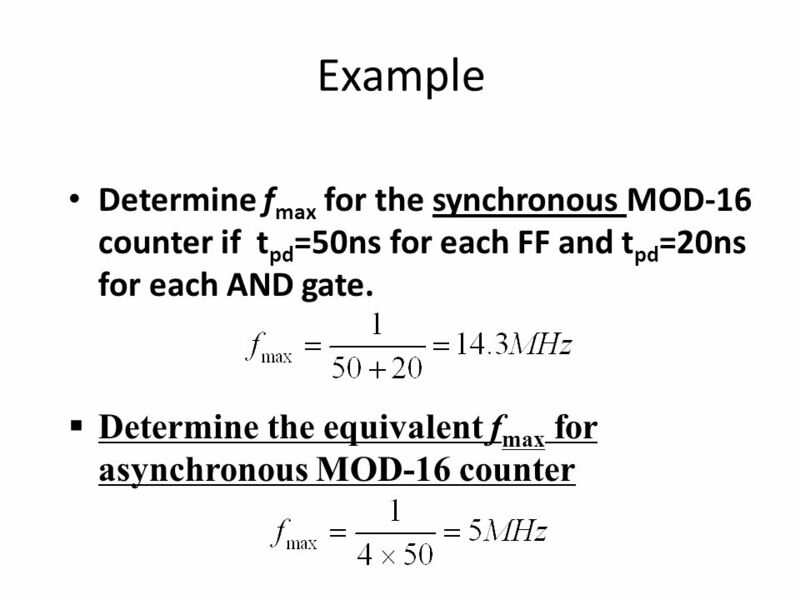 For a MOD-16 counter, the output from the last FF will have a frequency of 1/16 of the input clock frequency. 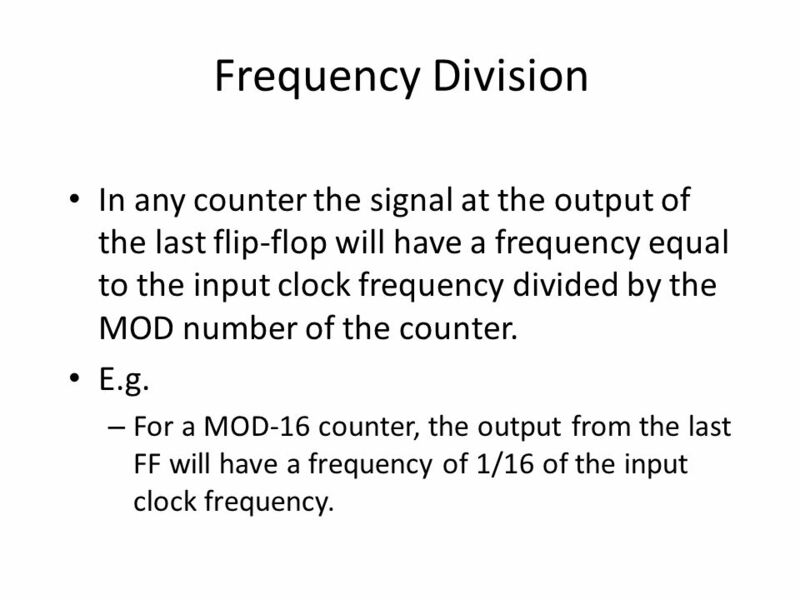 9 Frequency Division For the first flip-flop the frequency will be 1/2 of the original CLK frequency. 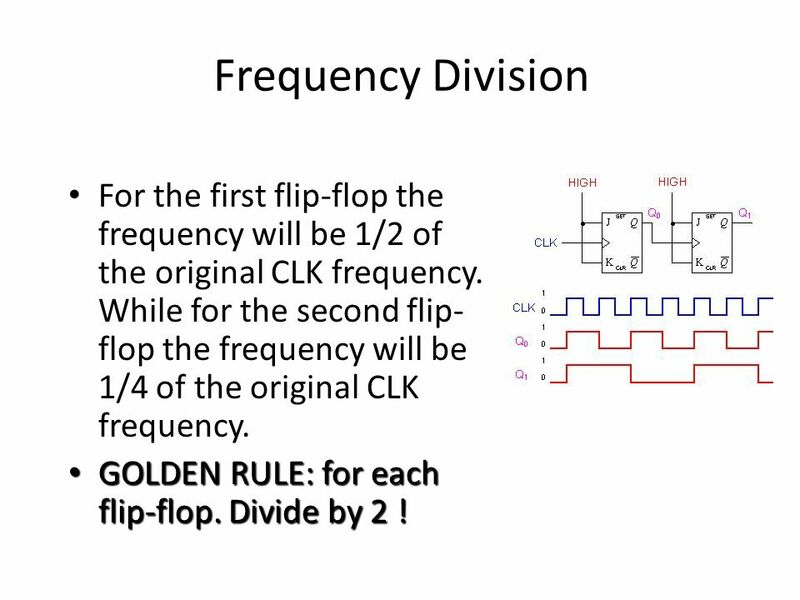 While for the second flip-flop the frequency will be 1/4 of the original CLK frequency. GOLDEN RULE: for each flip-flop. Divide by 2 ! 10 Question! 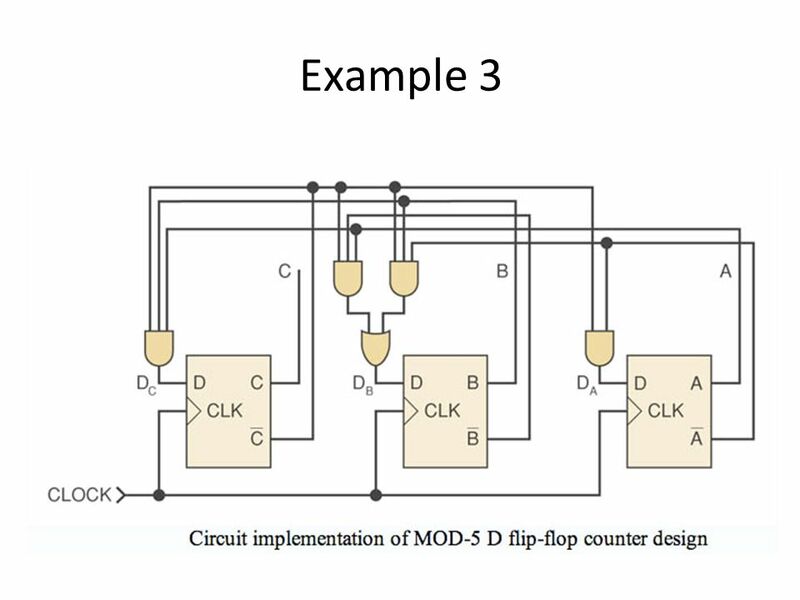 How many flip-flops are required for a MOD-32 counter? 25 = 32, therefore 5 Flip-Flops are required Now! 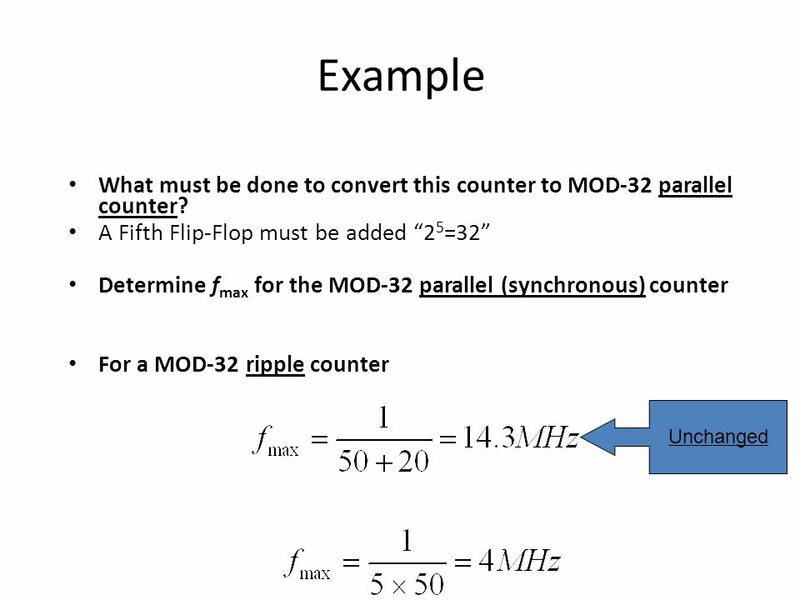 How many flip-flops are required for a MOD-60 counter? 26 =64 >60 !!!!! 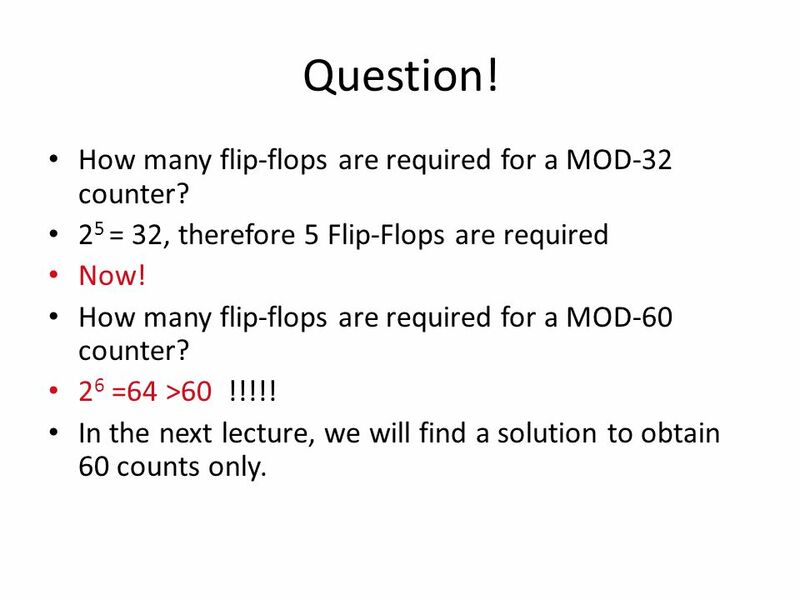 In the next lecture, we will find a solution to obtain 60 counts only. 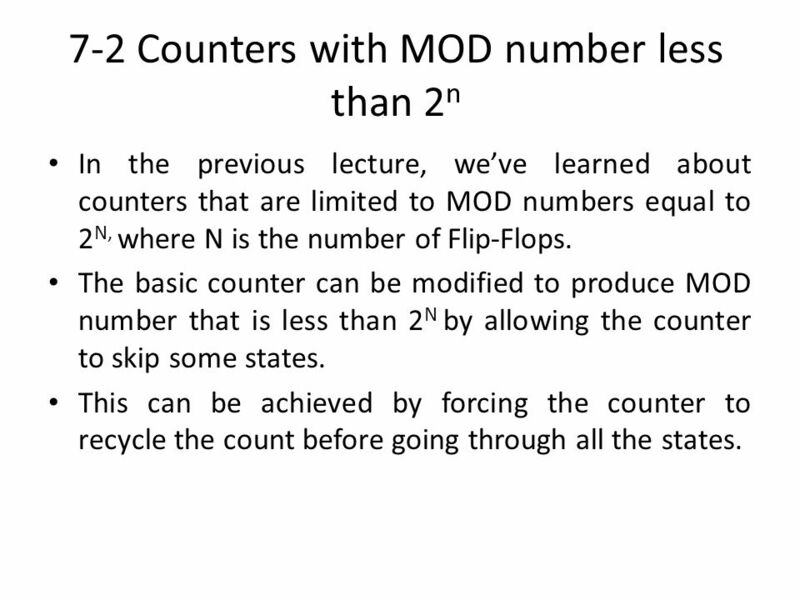 In the previous lecture, we’ve learned about counters that are limited to MOD numbers equal to 2N, where N is the number of Flip-Flops. 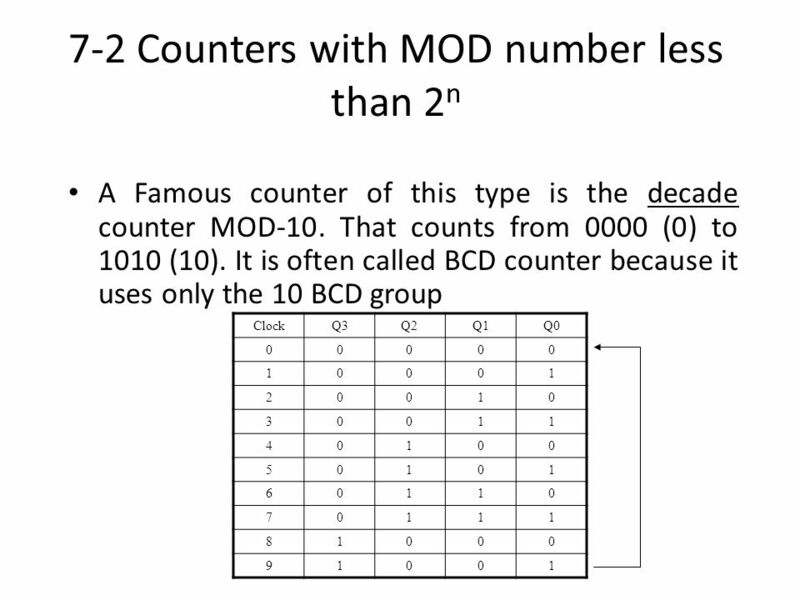 The basic counter can be modified to produce MOD number that is less than 2N by allowing the counter to skip some states. 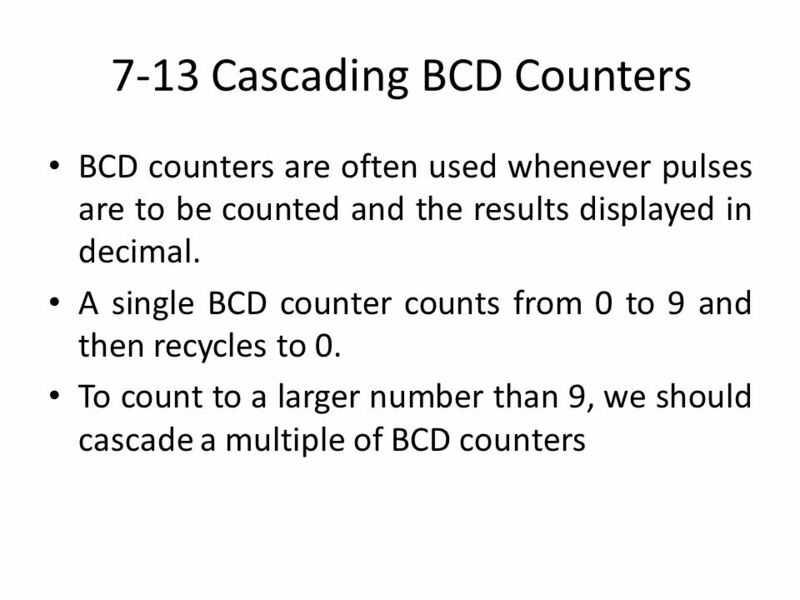 This can be achieved by forcing the counter to recycle the count before going through all the states. 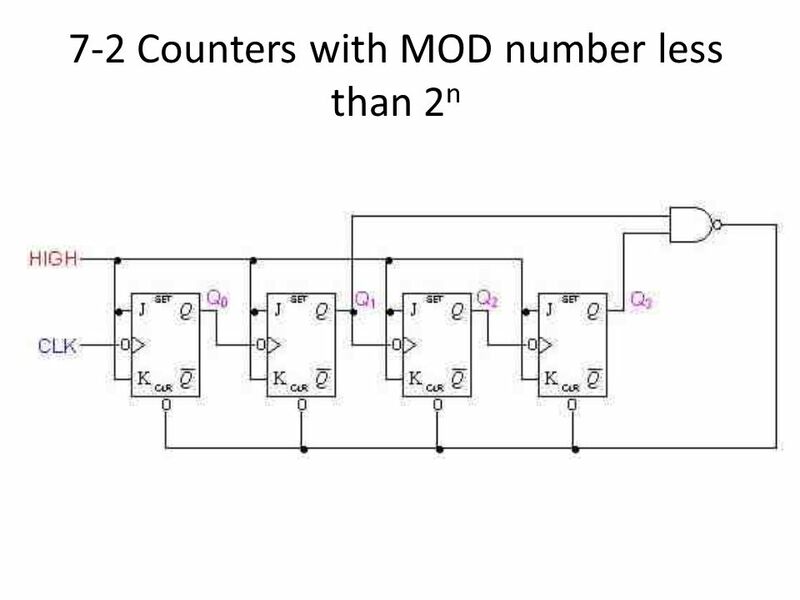 To design a counter of MOD-X: 1.Find the smallest number of FFs such that 2N ≥ X, and connect them as a counter. 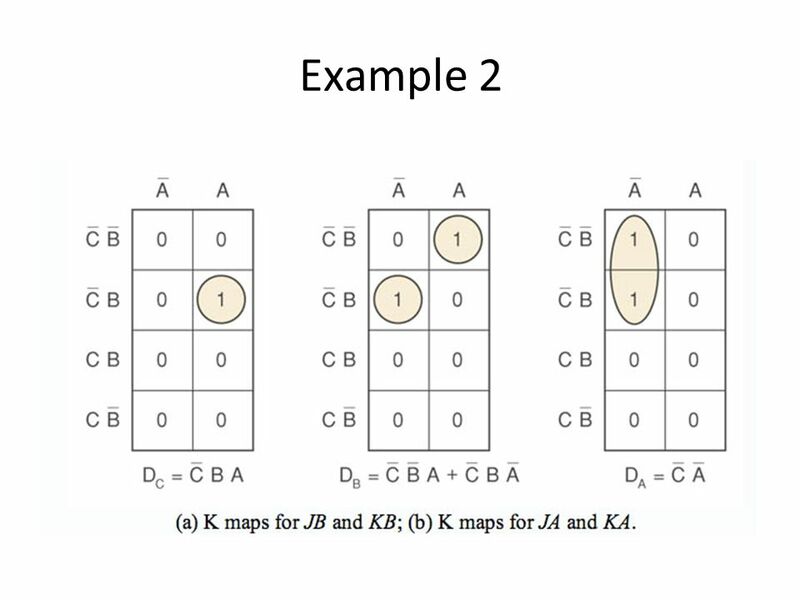 If 2N = X then skip the next steps. 2. 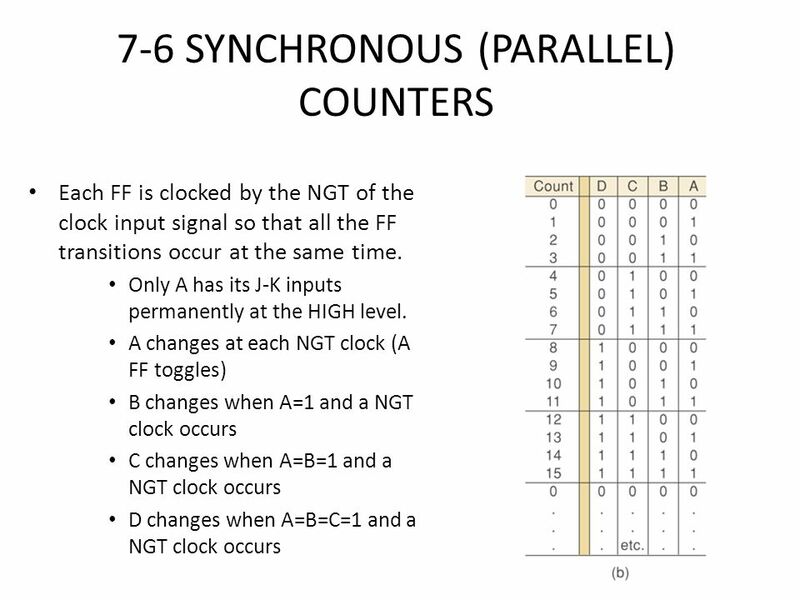 Connect a NAND gate to the asynchronous CLEAR inputs of all the FFs. 3. 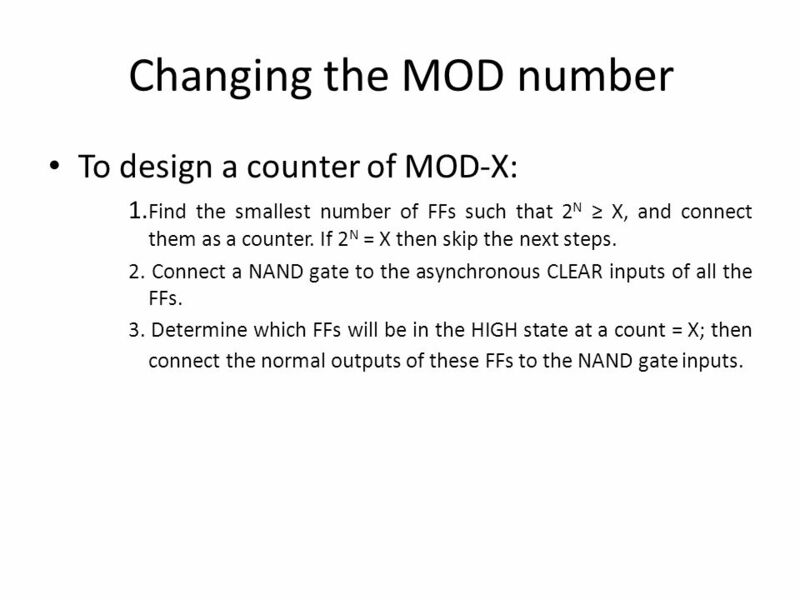 Determine which FFs will be in the HIGH state at a count = X; then connect the normal outputs of these FFs to the NAND gate inputs. 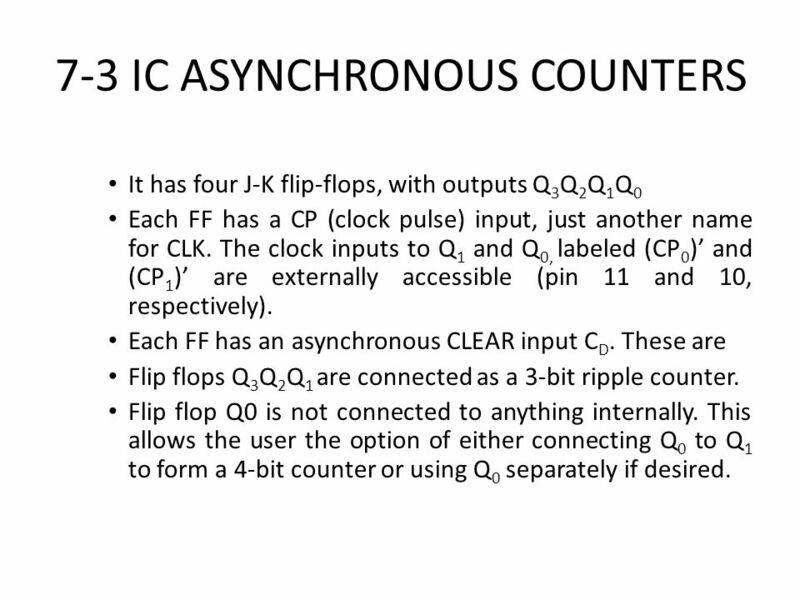 It has four J-K flip-flops, with outputs Q3Q2Q1Q0 Each FF has a CP (clock pulse) input, just another name for CLK. 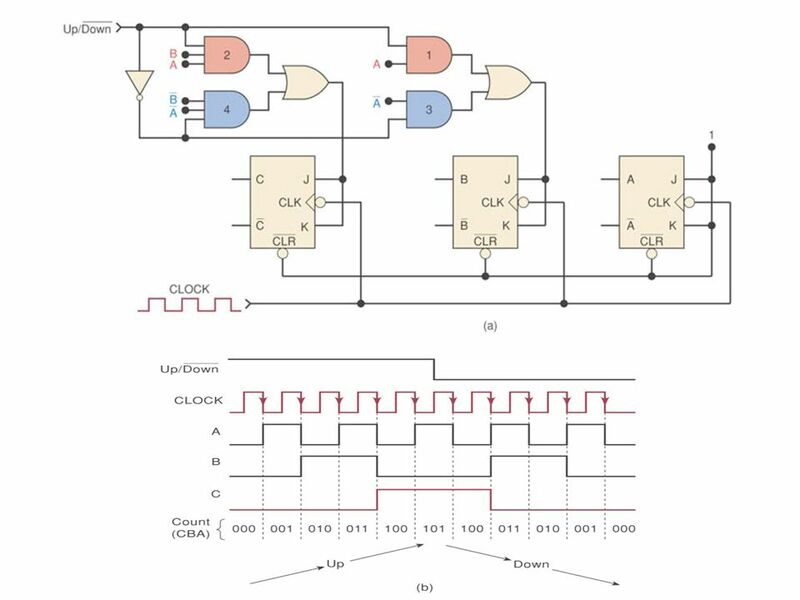 The clock inputs to Q1 and Q0, labeled (CP0)’ and (CP1)’ are externally accessible (pin 11 and 10, respectively). Each FF has an asynchronous CLEAR input CD. 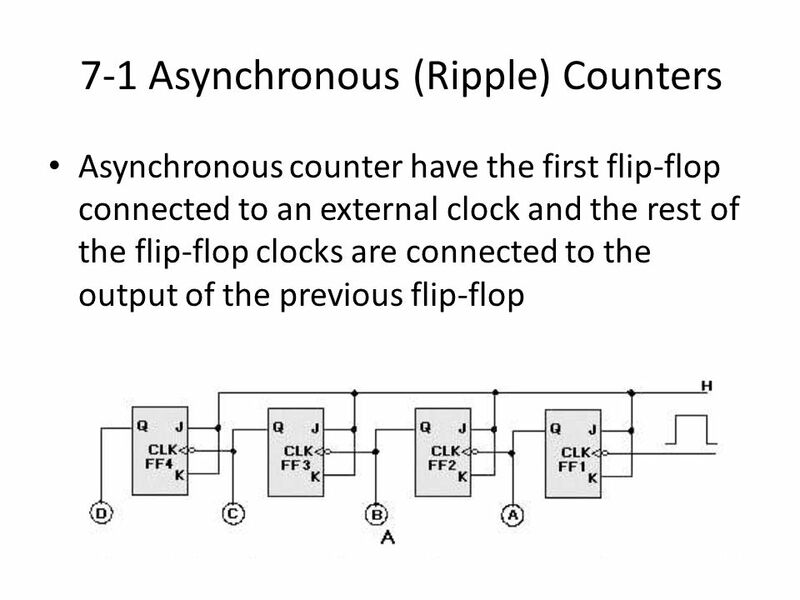 These are Flip flops Q3Q2Q1 are connected as a 3-bit ripple counter. 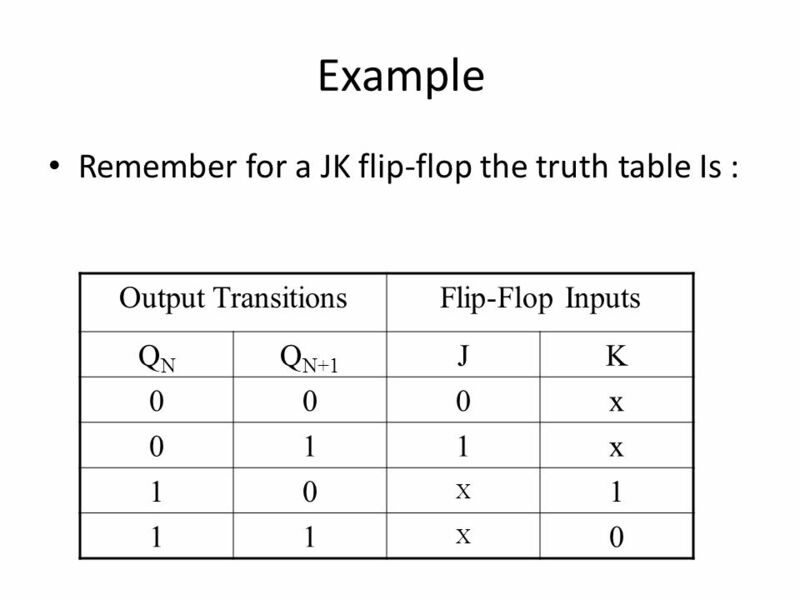 Flip flop Q0 is not connected to anything internally. 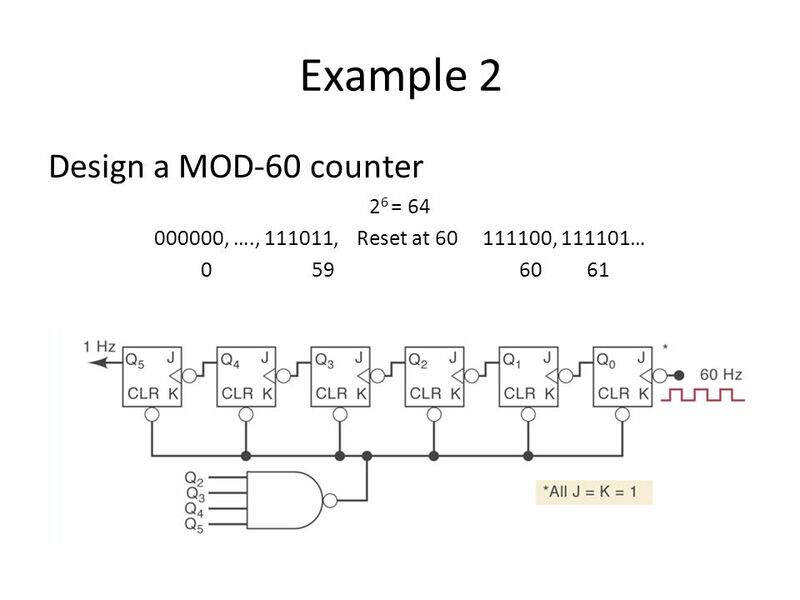 This allows the user the option of either connecting Q0 to Q1 to form a 4-bit counter or using Q0 separately if desired. 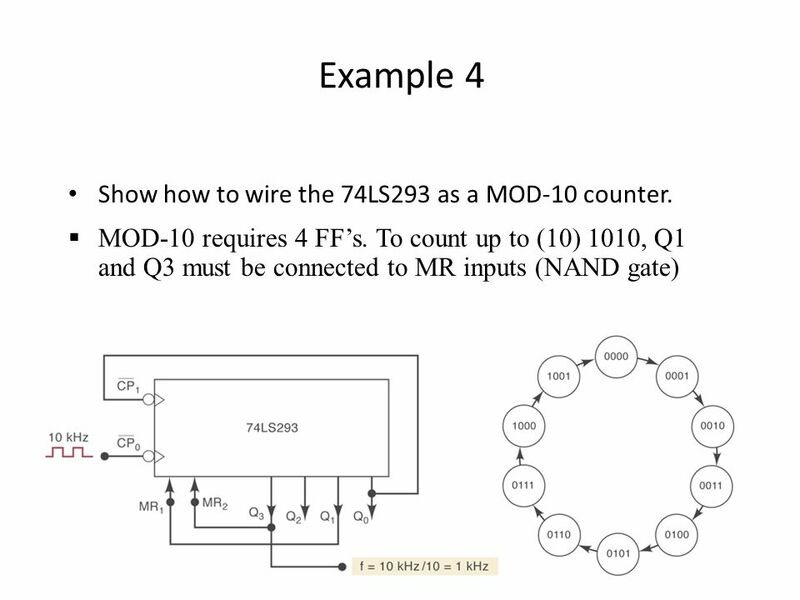 21 Example 4 Show how to wire the 74LS293 as a MOD-10 counter. 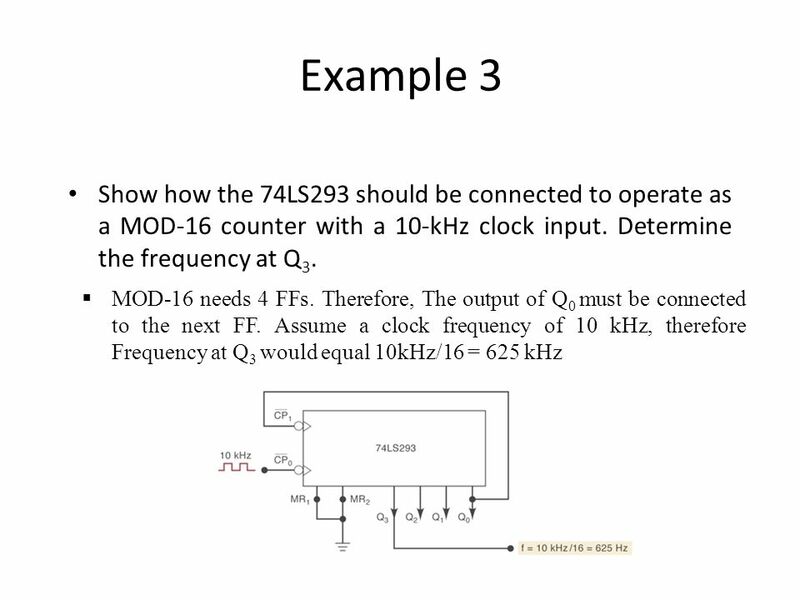 22 Example 5 Show how to wire the 74LS293 as a MOD-14 counter. 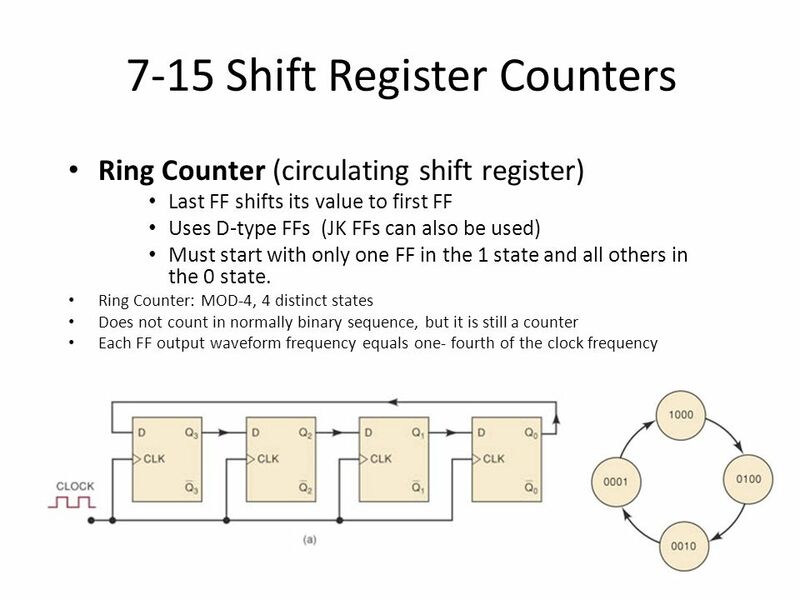 When the counter reaches (14) 1110 it should reset. 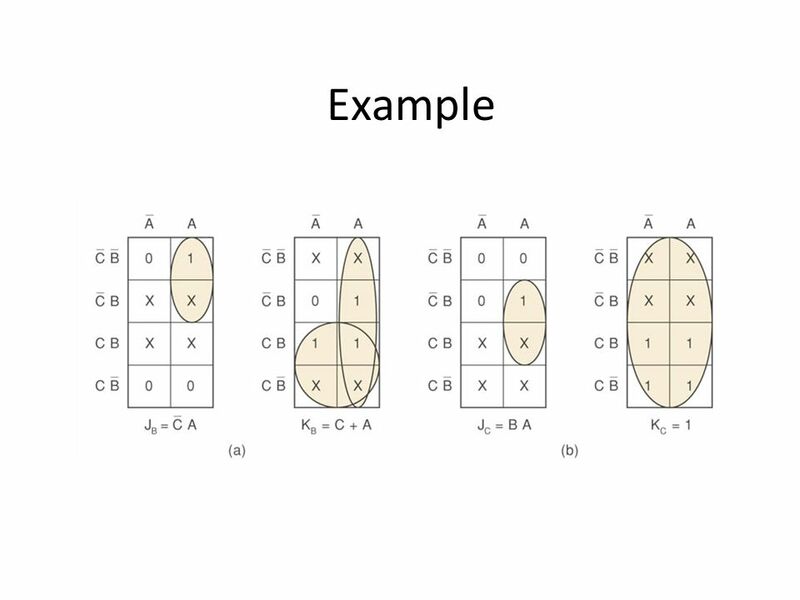 That is when Q1=Q2=Q3=1. 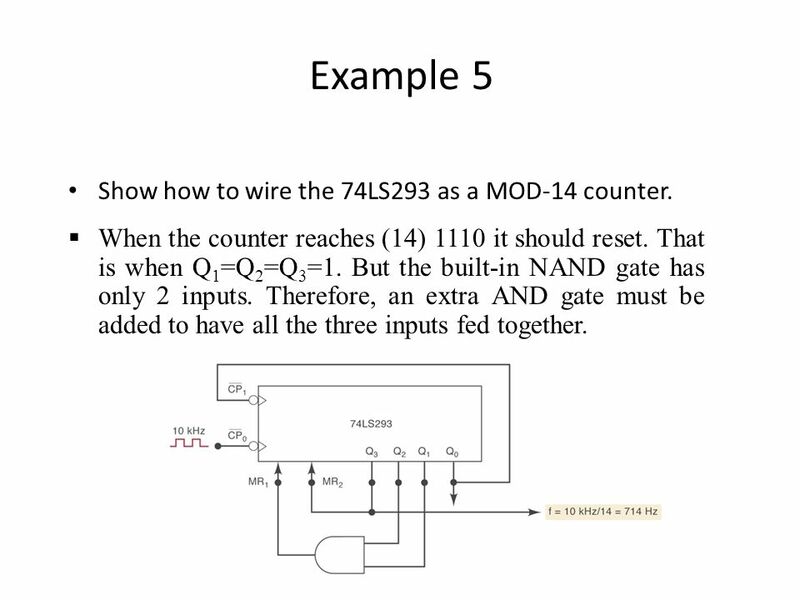 But the built-in NAND gate has only 2 inputs. 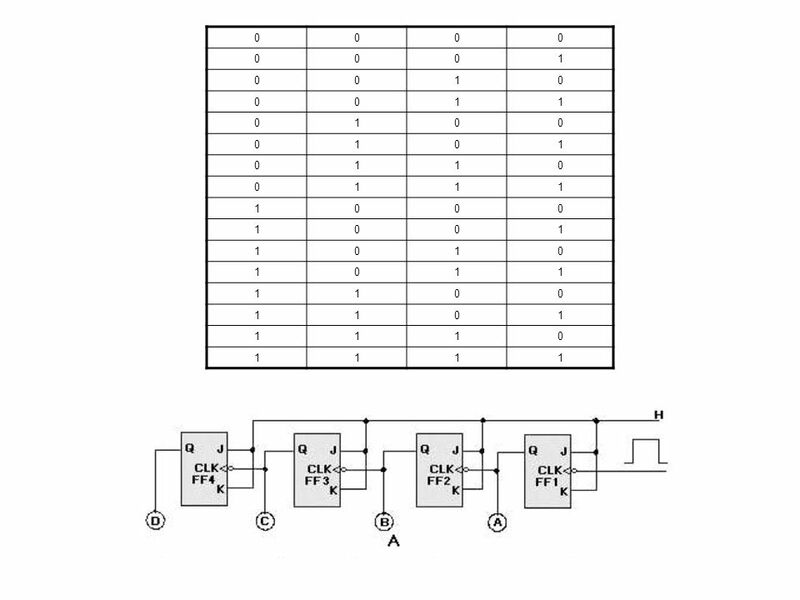 Therefore, an extra AND gate must be added to have all the three inputs fed together. 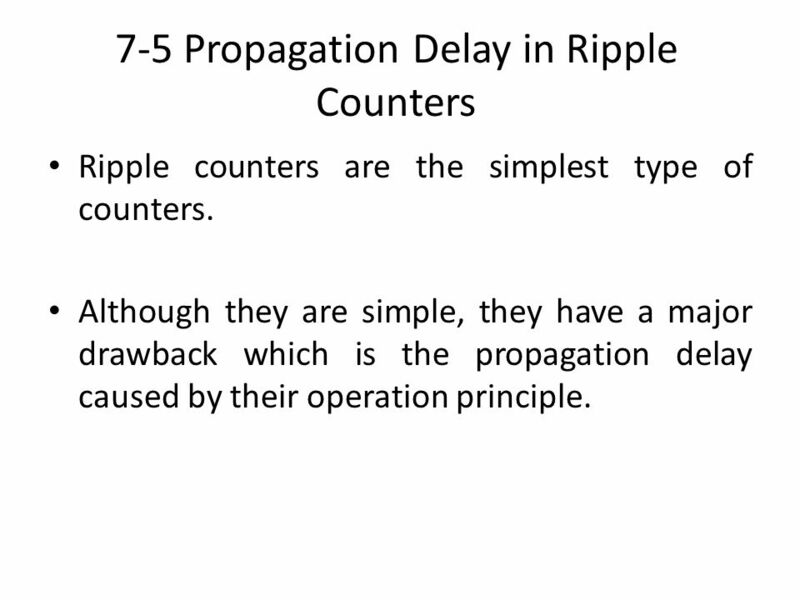 Ripple counters are the simplest type of counters. 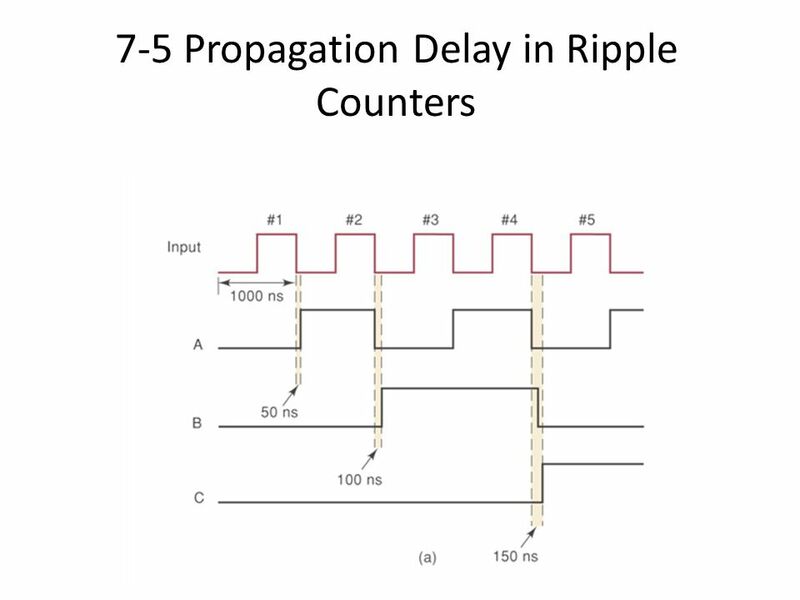 Although they are simple, they have a major drawback which is the propagation delay caused by their operation principle. 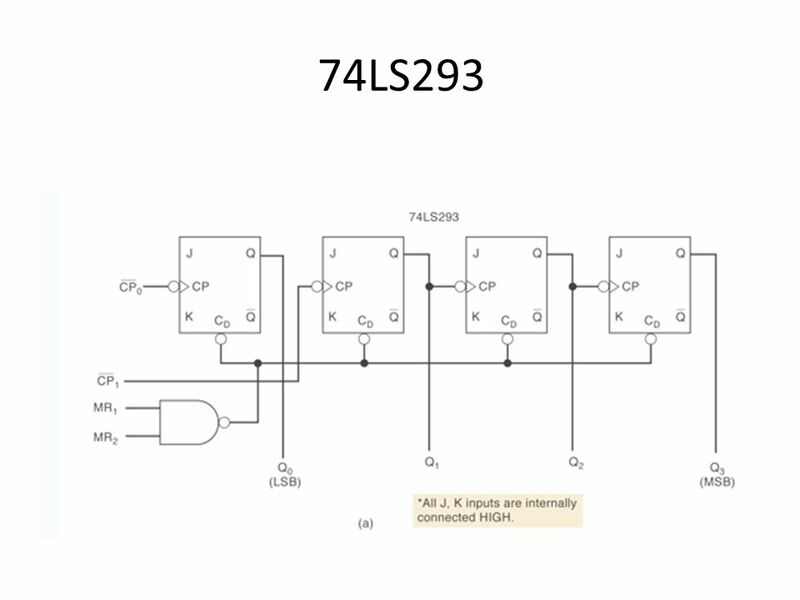 28 Example A 4-bit Ripple counter with tpHL= 16 nS and tpLH= 24 nS, using 74LS112 J-K FF. 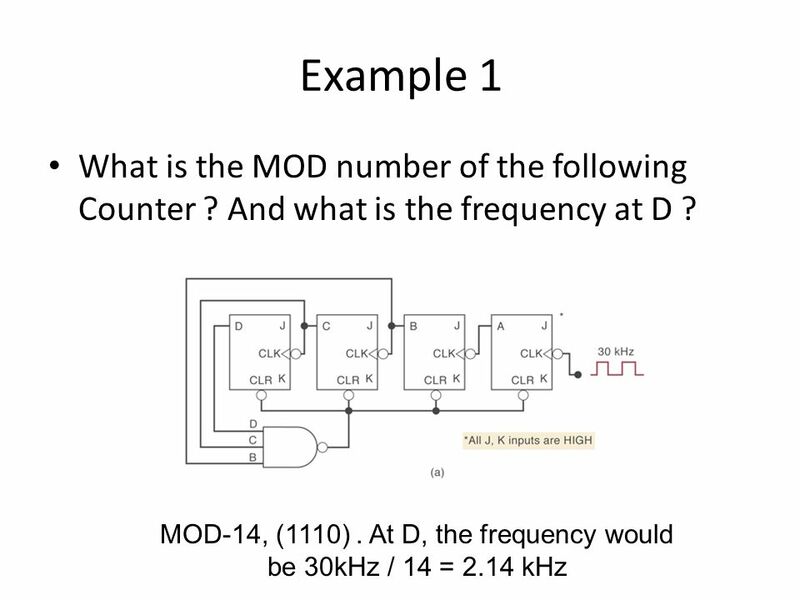 find the maximum frequency for a proper operation of the counter. 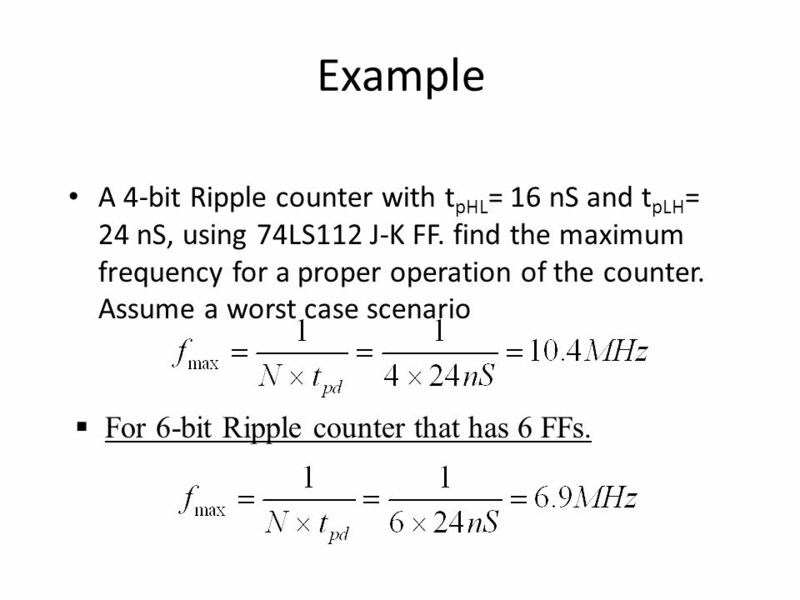 Assume a worst case scenario For 6-bit Ripple counter that has 6 FFs. 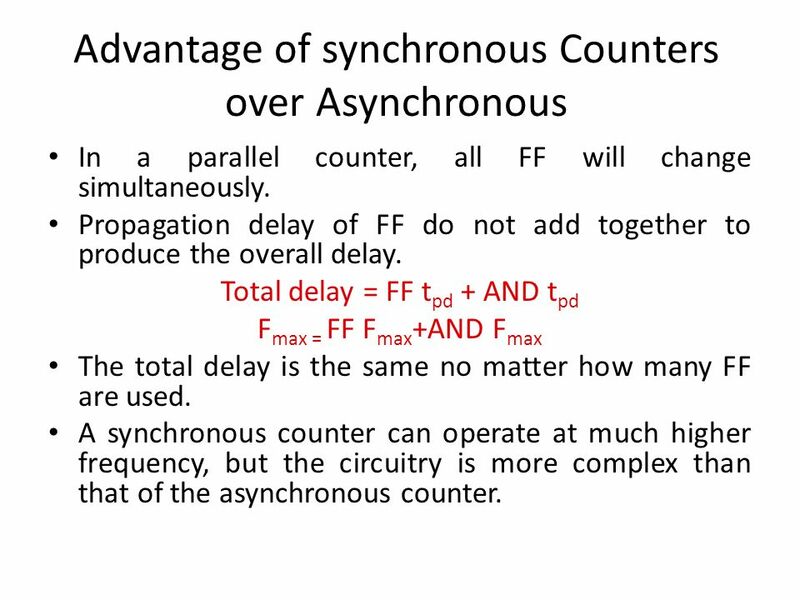 The synchronous counters have all of the FF’s triggered simultaneously. 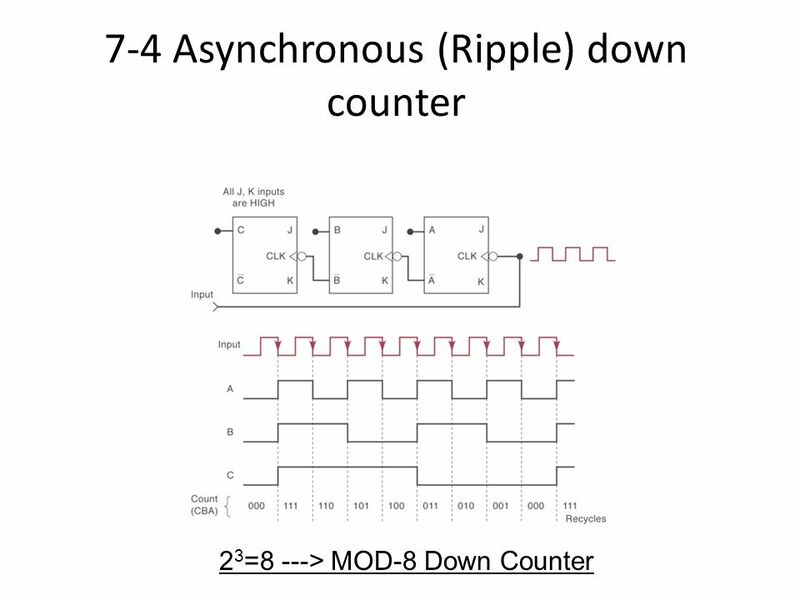 That is, all the CLK inputs are connected together Synchronous counters require more circuitry than the asynchronous counters. 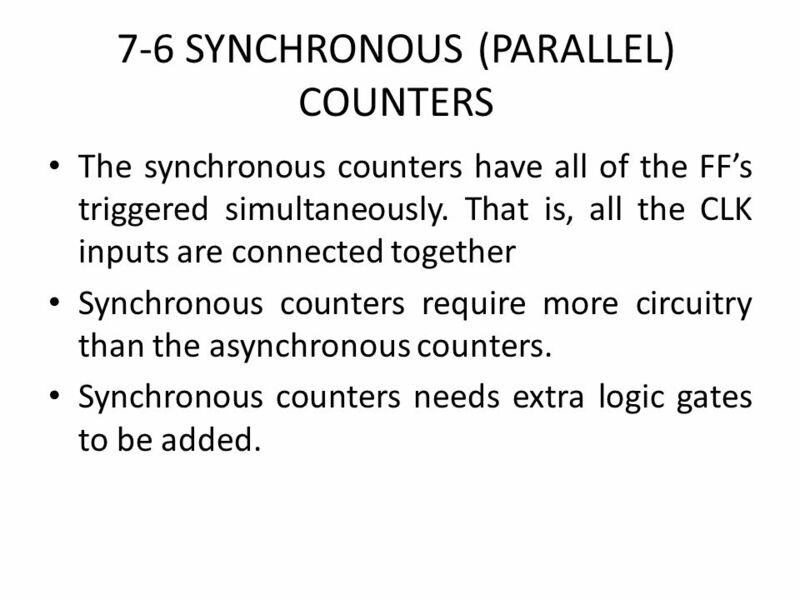 Synchronous counters needs extra logic gates to be added. 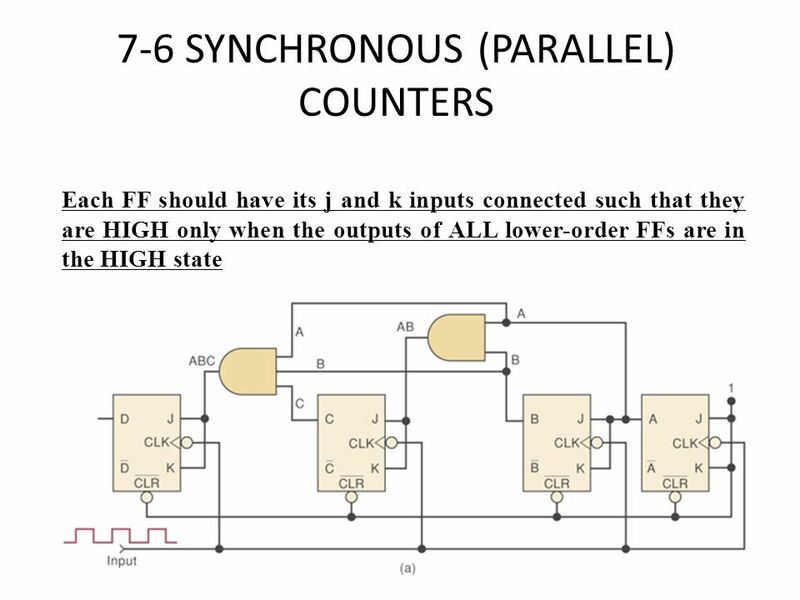 In a parallel counter, all FF will change simultaneously. 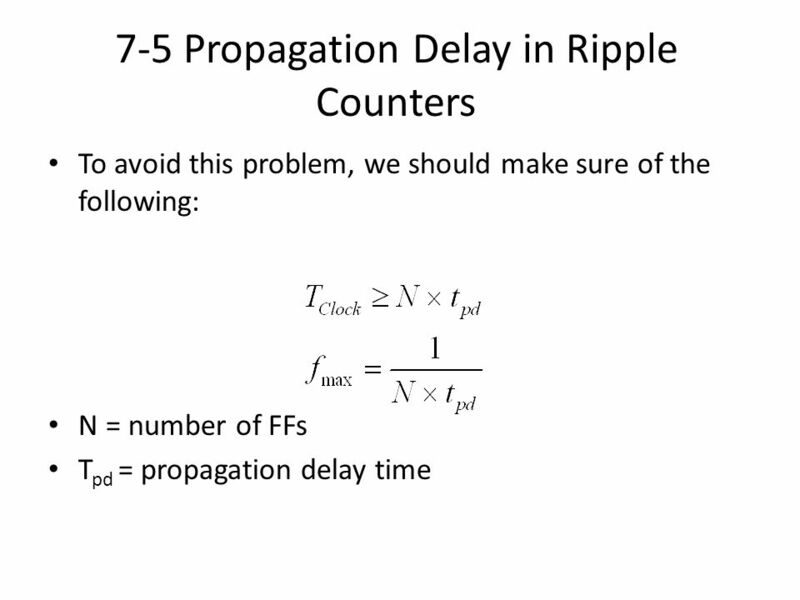 Propagation delay of FF do not add together to produce the overall delay. Total delay = FF tpd + AND tpd Fmax = FF Fmax+AND Fmax The total delay is the same no matter how many FF are used. 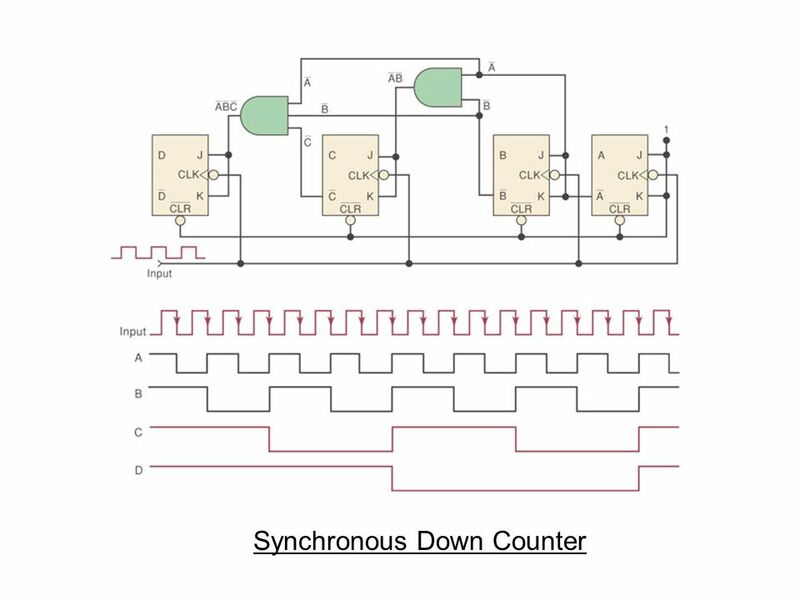 A synchronous counter can operate at much higher frequency, but the circuitry is more complex than that of the asynchronous counter. 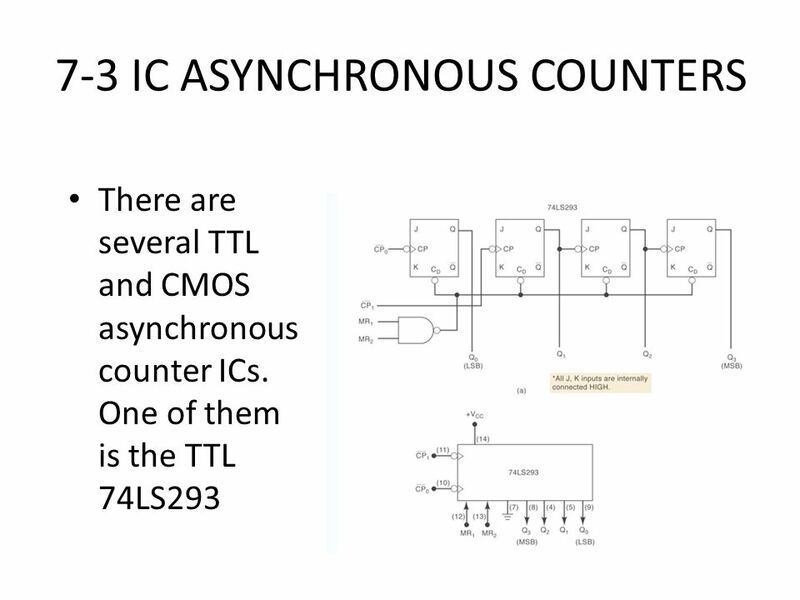 Many synchronous counters that are available as ICs are designed to be presettable. 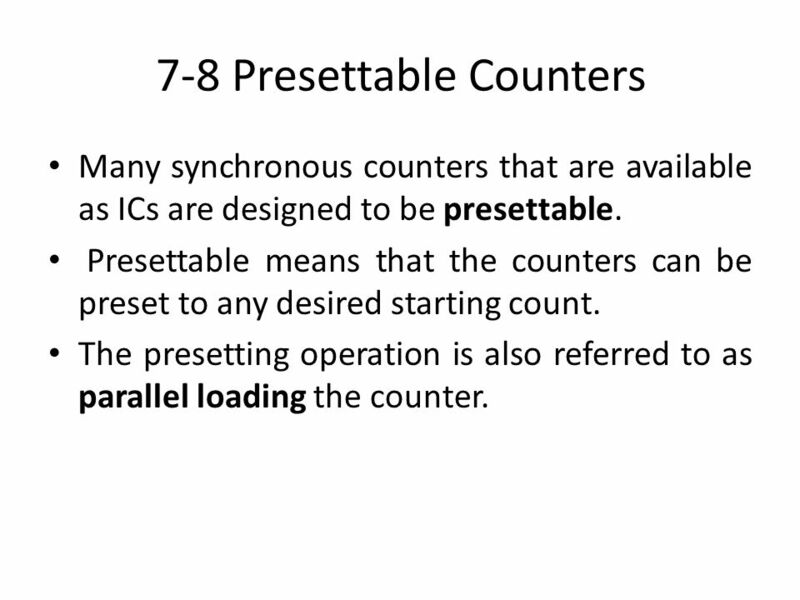 Presettable means that the counters can be preset to any desired starting count. 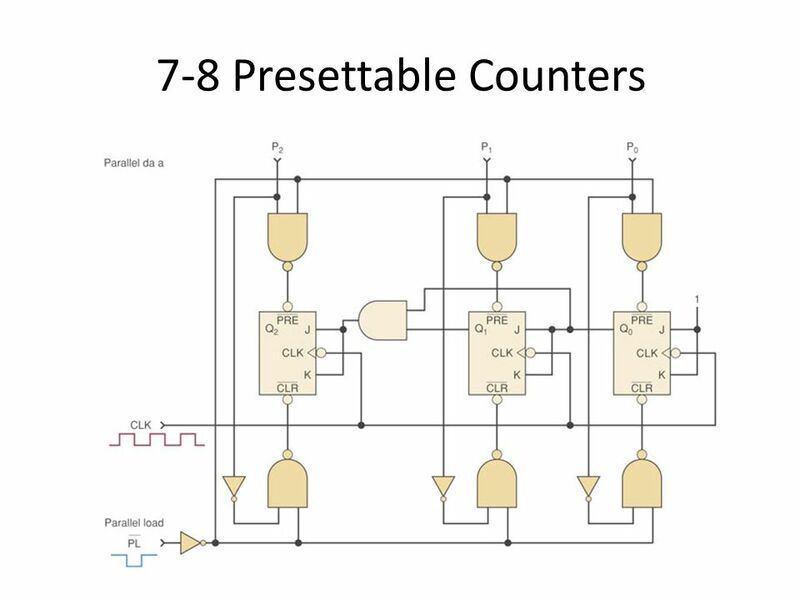 The presetting operation is also referred to as parallel loading the counter. 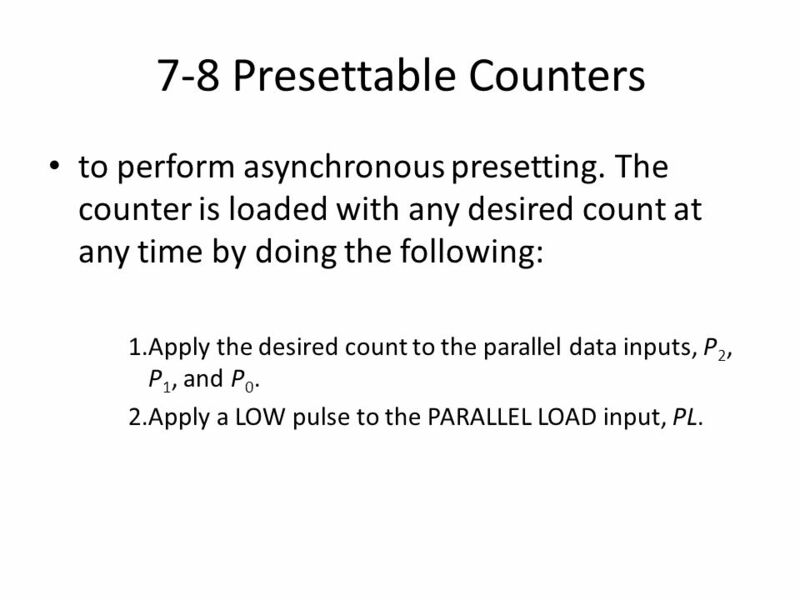 to perform asynchronous presetting. 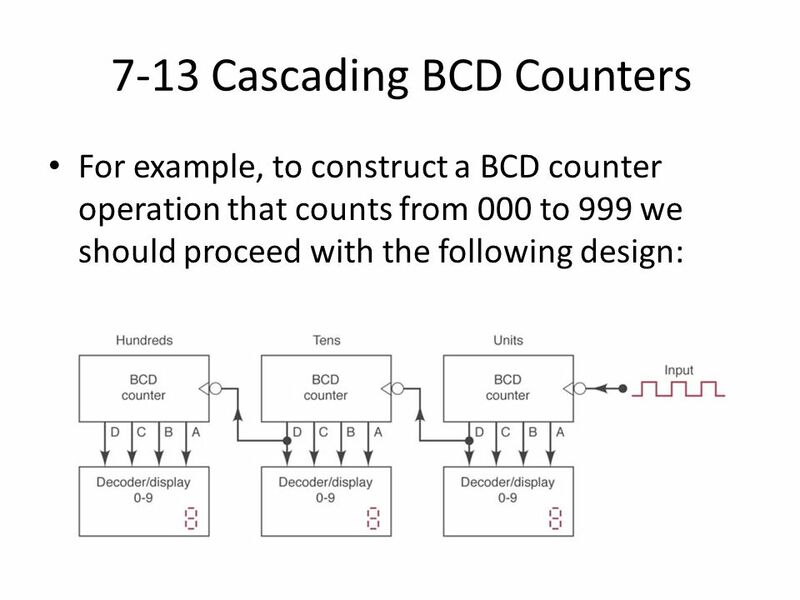 The counter is loaded with any desired count at any time by doing the following: 1.Apply the desired count to the parallel data inputs, P2, P1, and P0. 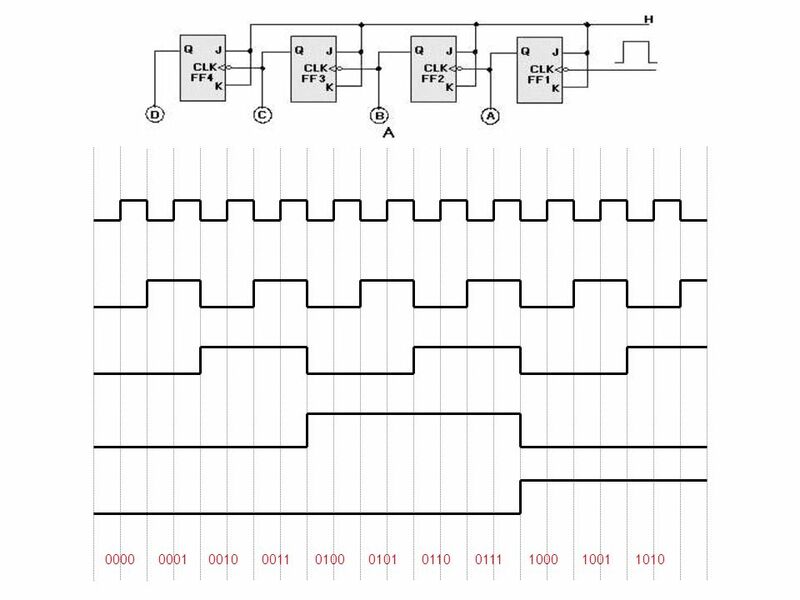 2.Apply a LOW pulse to the PARALLEL LOAD input, PL. 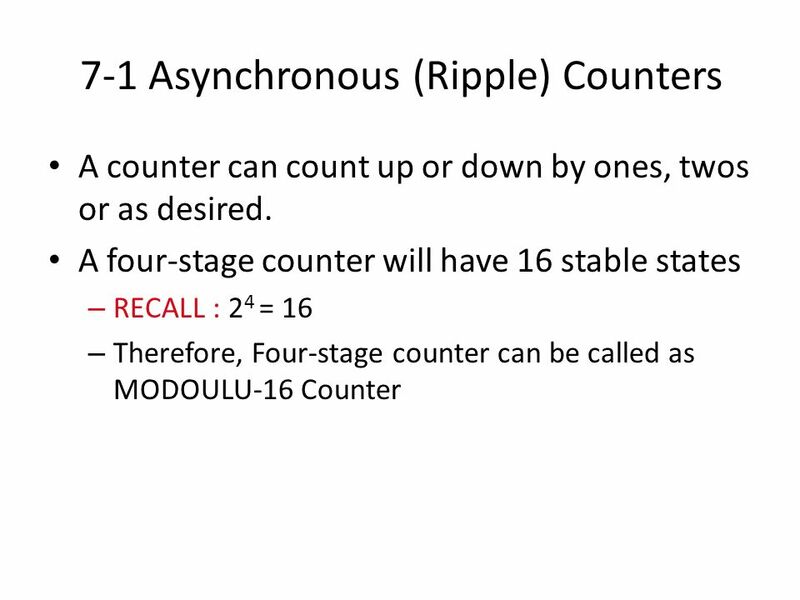 1.Initially all counters are reset to 0. 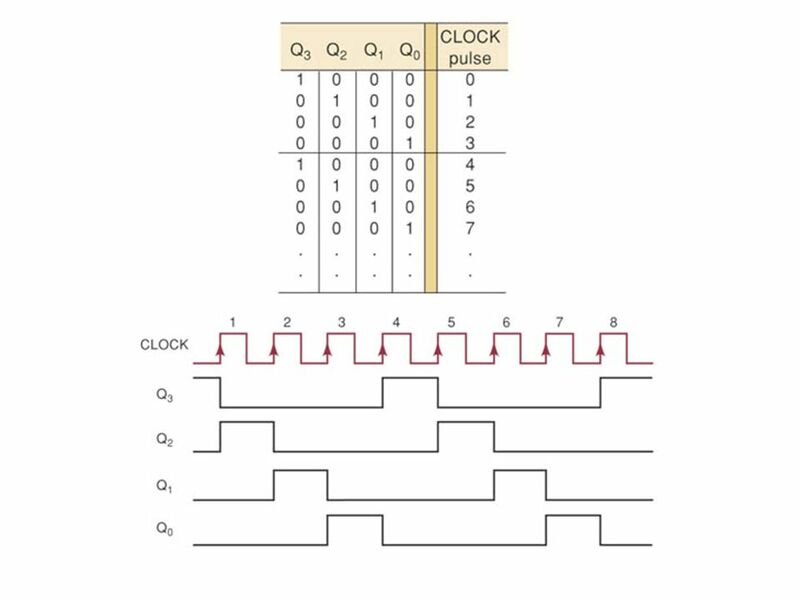 2.Each input pulse advances the first counter once. 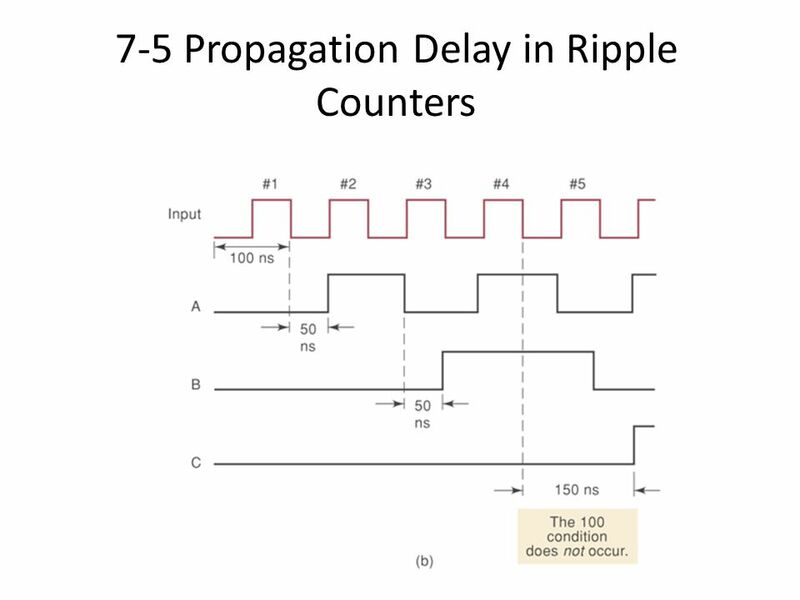 3.The 10th input pulse causes the counter to recycle, which advances the second counter 1. 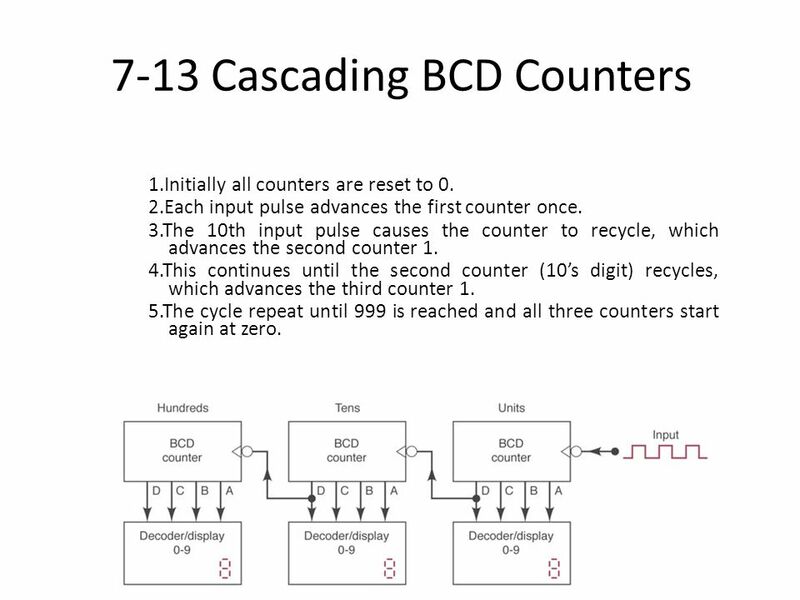 4.This continues until the second counter (10’s digit) recycles, which advances the third counter 1. 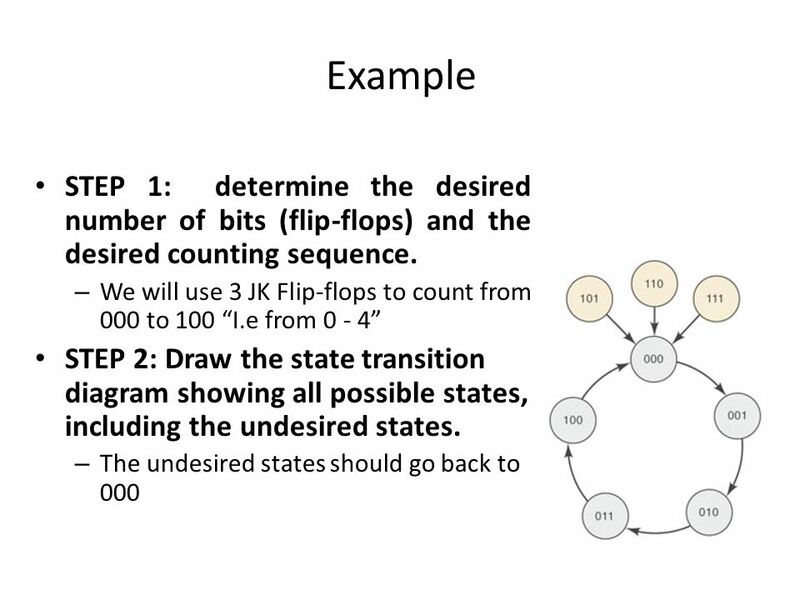 5.The cycle repeat until 999 is reached and all three counters start again at zero. 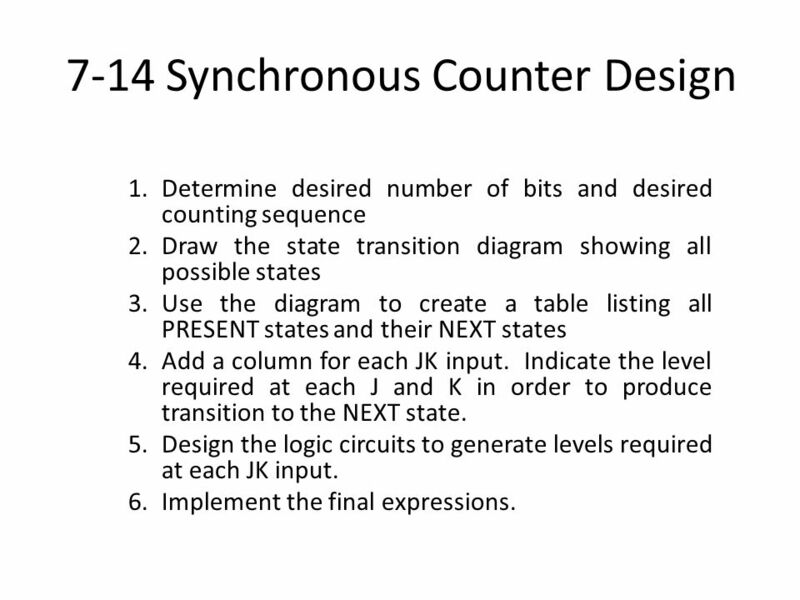 Determine desired number of bits and desired counting sequence Draw the state transition diagram showing all possible states Use the diagram to create a table listing all PRESENT states and their NEXT states Add a column for each JK input. 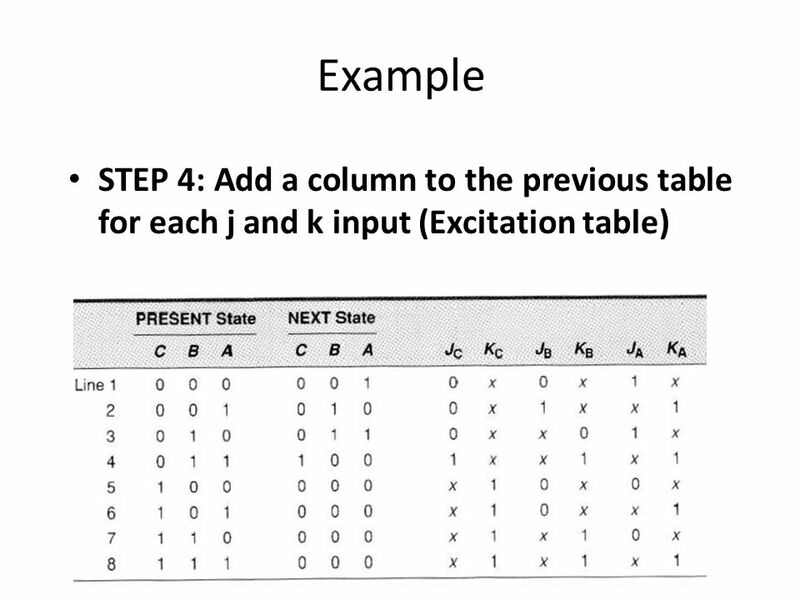 Indicate the level required at each J and K in order to produce transition to the NEXT state. 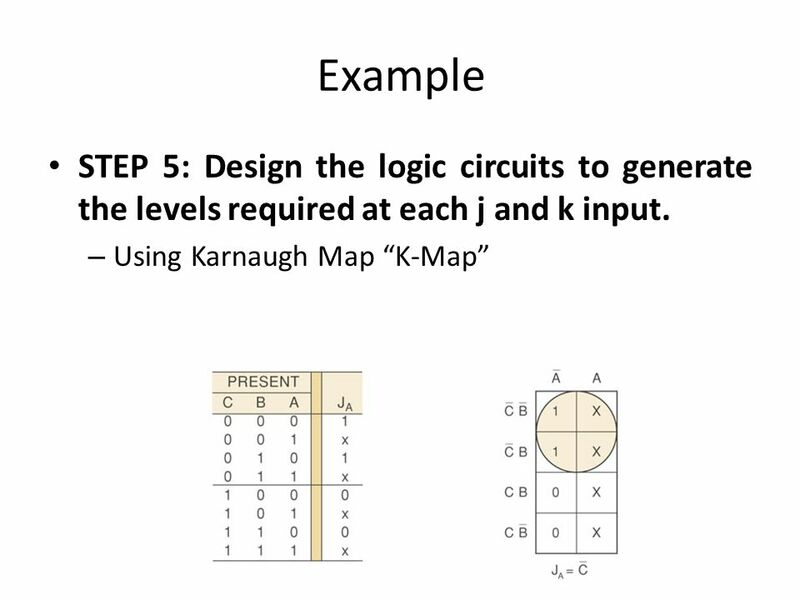 Design the logic circuits to generate levels required at each JK input. 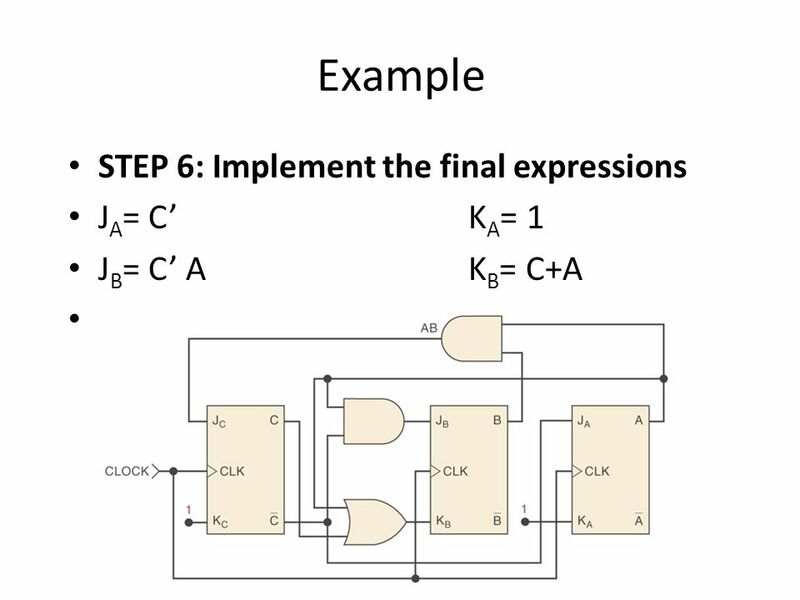 Implement the final expressions. 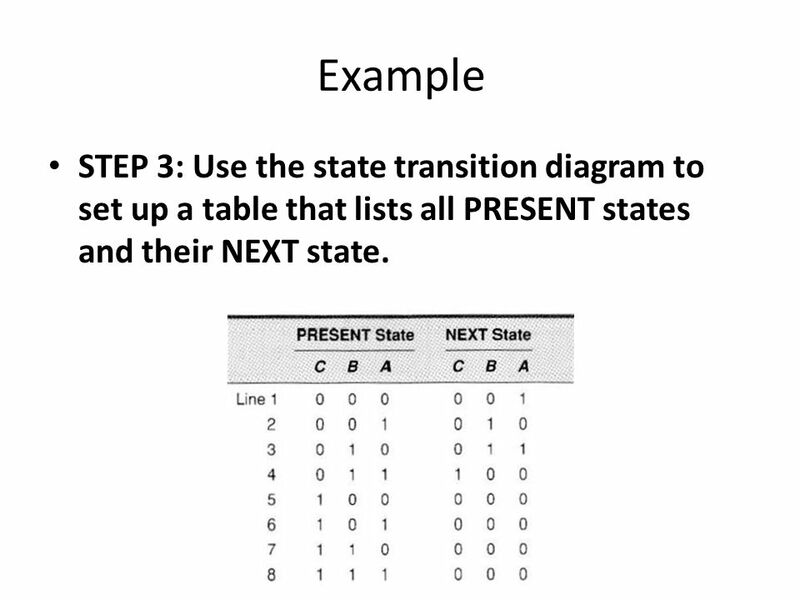 46 Example STEP 3: Use the state transition diagram to set up a table that lists all PRESENT states and their NEXT state. 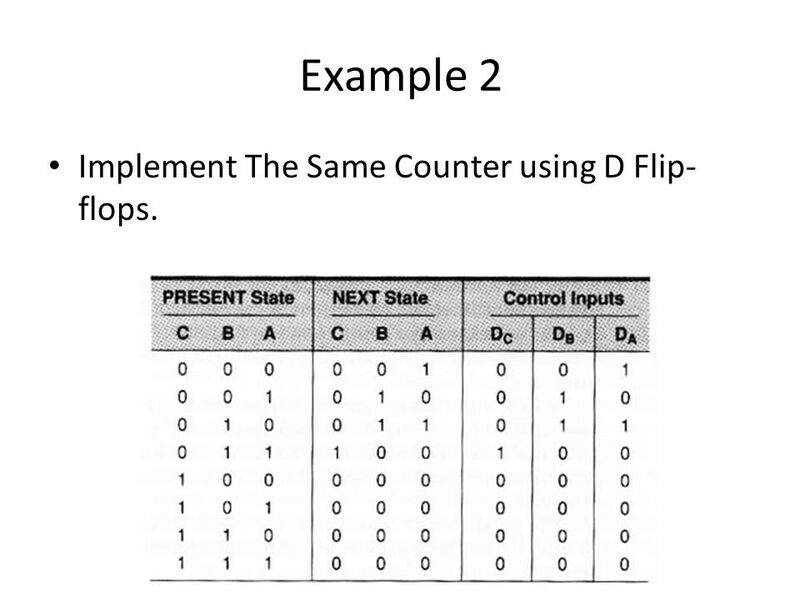 52 Example 2 Implement The Same Counter using D Flip-flops. 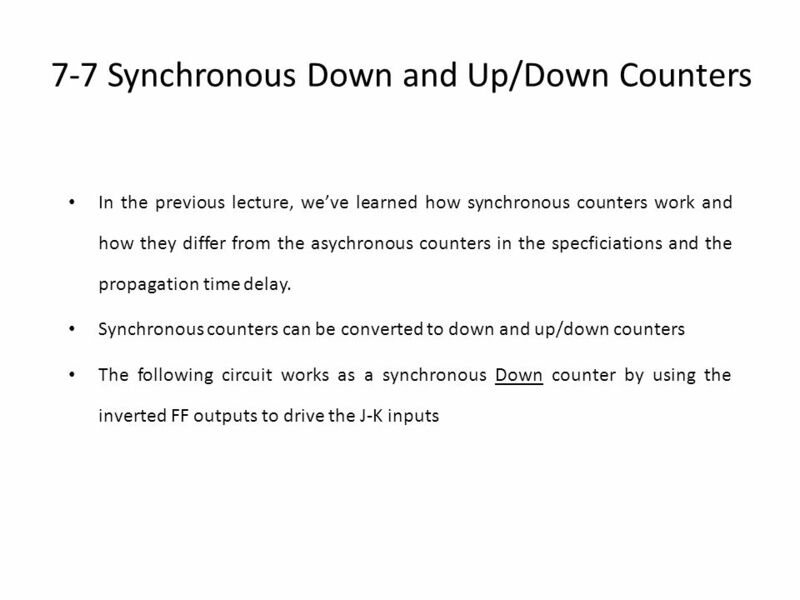 Download ppt "Counters and Registers"
ENGIN112 L27: Counters November 5, 2003 ENGIN 112 Intro to Electrical and Computer Engineering Lecture 27 Counters. 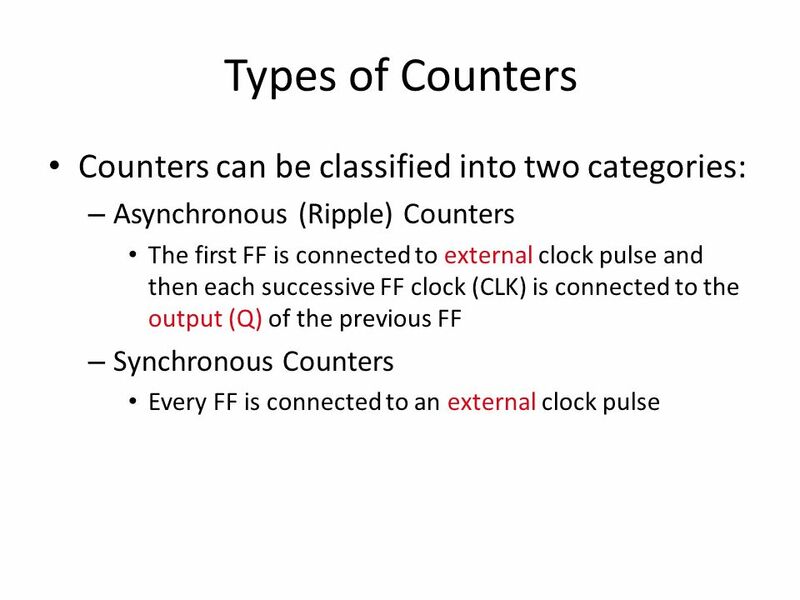 CS370 Counters. 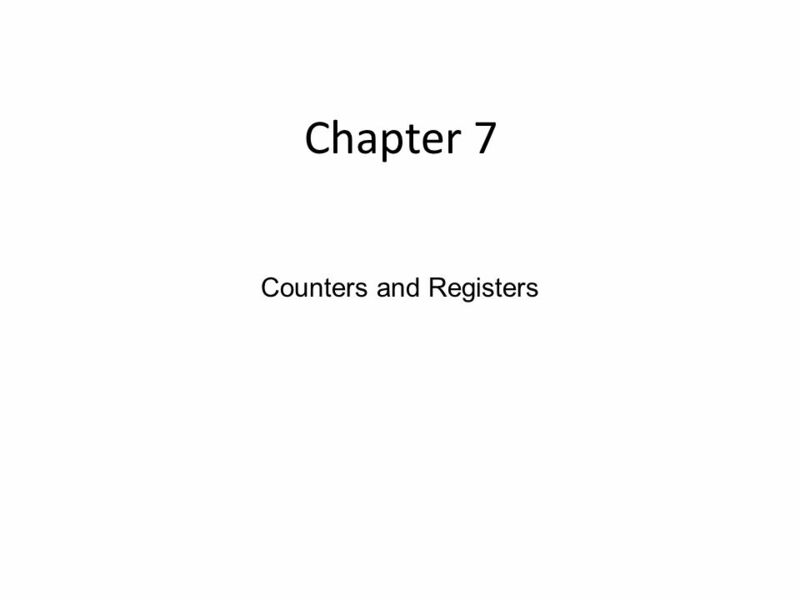 Overview °Counter: A register that goes through a prescribed series of states °Counters are important components in computers. °Counters.